Damning emails from Hillary Clinton's campaign chairman did not come from Russian hackers and the claim is being made to "delegitimize" Donald Trump, WikiLeaks founder Julian Assange told Fox News' Sean Hannity in an exclusive interview. Hannity sat down with Assange in London's Ecuadorian embassy, where the Australian native has been holed up for five years battling extradition to Sweden on unrelated charges. Part I of the interview is set to air Tuesday night at 10 p.m. on Fox News Channel's "Hannity." Hannity told Fox News' Bill Hemmer "I believe everything (Assange) said," and praised the Internet activist for his commitment to government transparency. WikiLeaks founder Julian Assange told Fox News that hacked emails from the Democratic National Committee and Hillary Clinton’s campaign chairman did not come from a Russian source. Fox News host Sean Hannity asked Assange if he could “tell the American people 1,000%” that WikiLeaks did not get the hacked material from Russia. Assange’s reliability on this matter, however, is questionable. Former United Nations ambassador John Bolton, for instance, told Fox News on Tuesday that he wouldn’t trust Assange. Assange also accused the Obama administration of trying to undermine the incoming administration of President-elect Donald Trump. The Obama administration has strongly condemned the hacks and increased sanctions on Russia. US intelligence agencies have blamed Russia for leaking emails from DNC officials and Clinton campaign chairman John Podesta in the weeks and months leading up to the election. US officials have said Russia was attempting to sway the election in Trump’s favor. Emails showed DNC officials seeming to favor Clinton over her Democratic primary challenger Sen. Bernie Sanders. The Podesta emails contained excerpts of Clinton’s controversial speeches to financial firm Goldman Sachs and also showed campaign officials speaking candidly about the election. Trump has refused to pin blame on Russia for the hacks, and last week he said he has information others don’t on who is responsible. “I also know things that other people don’t know, and so they cannot be sure of the situation,” he told reporters. It’s unclear what exactly Trump was referring to, but it’s possible that it’s the interview with Assange. Julian Assange, the WikiLeaks founder who has been accused of targeting Hillary Clinton in order to help Donald Trump due to his connections with the regime of Russian dictator Vladimir Putin, has conducted an interview with Fox News’ Sean Hannity that will only further reinforce those suspicions. When Hannity asked Assange if he could “tell the American people 1000%” that WikiLeaks did not get the hacked Democratic National Committee emails from Russia, he offered a hedged reply. “Yes. We can say, we have said, repeatedly that over the last two months that our source is not the Russian government and it is not a state party,” Assange said. While this reply rules out institutions, it does not acknowledge the possibility that the material was received by an agent working for or with Russian state institutions. Assange also echoed the line being repeated by both Putin and President-elect Donald Trump — namely, that President Obama and the intelligence community are agreeing that Russia was involved in a conspiracy to hurt the incoming president. “So my interpretation is that in Russia there are competitors to WikiLeaks, and no WikiLeaks staff speak Russian, so for a strong culture which has its own language, you have to be seen as a local player,” Assange said. In April, when the Panama Papers exposed that widespread corruption among Russia’s political and business elites, Assange went to Twitter to denounce them — even though, as the operator of a website devoted to leaking sensitive information from corrupt governments, that opposition was highly hypocritical (a term this reporter is happy to defend as an objective statement). “#PanamaPapers Putin attack was produced by OCCRP which targets Russia & former USSR and was funded by USAID and [George] Soros,” read one tweet. “US govt funded #PanamaPapers attack story on Putin via USAID. Some good journalists but no model for integrity,” read another tweet. Incidentally, WikiLeaks could provide no proof that the U.S. government had been in any way involved in the Panama Papers being leaked. Also interestingly, Putin began using the same argument as Assange to delegitimize the Panama Papers shortly after the WikiLeaks tweets. 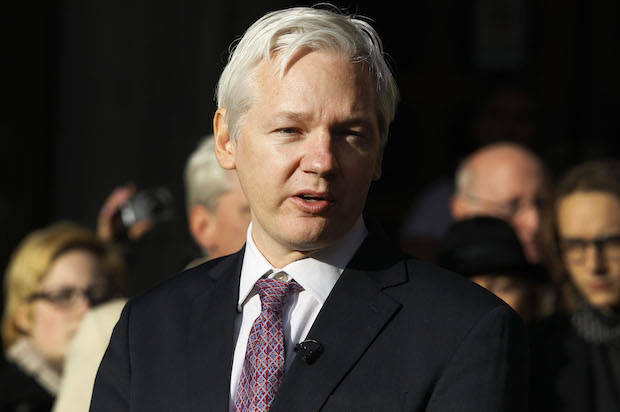 Assange’s other connections to the Russian government include a half-hour political TV show called “The Julian Assange Show” that he aired on Russia Today, Russia’s state-owned and pro-Putin television network; by his own admission encouraging NSA whistleblower Edward Snowden to seek asylum in Russia instead of Latin America; and suggesting the use of Russians for his Security Service during his political asylum at the Ecuadorian Embassy in London, where he has resided since 2010. 0 Response to "Assange: Russian government not the source of WikiLeaks emails"